Are Bangladesh’s local government bodies democratic? Local governments (LG) give rural people in Bangladesh opportunities to taste freedom and participation. In 2015, there was a paradigm shift in the local government system when the Cabinet decided to hold local polls on partisan basis. With the change in the century old practice of non-party poll at the local body level to the first-ever partisan poll, Mohammad Tarikul Islam explores the challenges ahead and the strength and weakness of LG as a democratic entity. Local government (LG) is a fertile ground for democracy, as it includes the most marginalised people in the process of governance, gives them the capability to ask questions, and opportunities to seek accountability. For Third World countries, it is an indispensable pre-condition for sustainable development. Local institutions are also schools for democracy as they train leaders, on whom the success of a democracy is dependent. LG is an integral part of the central government of Bangladesh. However, its long existence is confronted with some chronic problems which have curtailed the growth of the units as viable institutions that deliver democratic education to the local people. Union Parishad (UP), the lowest tier of LG, plays a crucial role in strengthening democracy and for the sustainable development of the rural communities. Generally, people are interested in UP bodies as they can directly participate in a large scale. Since its inception, Bangladesh has struggled to be a democratic developed nation. However, several political ups and downs, introduction of one party system, military rules, and the competition in political parties to capture power have placed the democratic journey of the country in jeopardy. The political problems that Bangladesh is suffering are not rooted in the Constitution, but in the political culture. It has hurt democratisation efforts within the local government structure of Bangladesh as well. A paradigm shift in the political system took place in Bangladesh on October 12, 2015 with the decision of the Cabinet to hold local polls on partisan basis. There are major challenges ahead for political parties with introductoion of the first-ever partisan poll. While the government claims that the local government elections will be more participatory by introduction of party-based elections, there are two schools of thoughts on this issue. According to the conservative school of thought, though it is a little too early to settle on the party-based electoral system of Union Parishads, the circumstances around Union Parishad elections deliver a wrong message. The volume of violence, the complaints related to nominations as well as corruption in the electoral system has been terrible. As the Union Parishad elections were held on a non-partisan basis in the past, many neutral and locally popular people had opportunities to be elected. This time, however, such people did not come forward in many cases. Moreover, corruption in the nomination process has turned out to be a real shame. Dedicated and honest politicians are also in the race of courting favors from the influential ones. The wisdom behind the party-based model of Union Parishad elections is thus being questioned heatedly. According to the liberal school of thought, it has opened up an opportunity for the local people to be mindful in selecting their local leaders as well as engaging in the development process at grassroots level. Such party-based local government election enables elected representatives to get the maximum benefit from the political government. The central political party in power an implement their agenda at the local level with maximum backing of UP elected representatives. Past observations of LG in Bangladesh show that the successive governments had to establish some kind of the local government structure in order to mobilise support of the rural communities in their favor by providing welfare measures. Hence, LG could not successfully provide opportunities to the people, irrespective of party affiliation, to participate in the development activities. The colonial pattern of administration in LG has been categorised as elitist and alienated nature. Administrative officials working at UP level are bureaucratic and alienated from the people, and therefore, people cannot properly take part in different activities of LG. The weakness of its socio-economic base remains a key obstacle in the way of democratic education through LG. The unequal economic structure trends to influencethe local bodies by pro-partied class. They often tend to suit their class interest and purposes. As a result, LG cannot render proper services to the people at local level. Besides, presence of local elite dissuades the general public from participating in the LG, which results in a less effective local government. In rural Bangladesh, this remains a major impediment to popular participation in local level elections. Such attitude results put the candidates who have lost and their supporters in conflict with the winners. Consequently, they do not cooperate with the winners, resulting in a challenging situation for the functioning of the elected council. Politico-administrative contradictions often disrupt the very functioning of LG units. It is apparent that, local people cannot provide any sort of inputs in decision making process of UP for their welfare. The national political activities are foisted upon the grassroots level units in different ways. Therefore, people at local level divide along political lines and they do not cooperate and coexist. Patron-client relationship endangers the effective role of UP in democratic development. 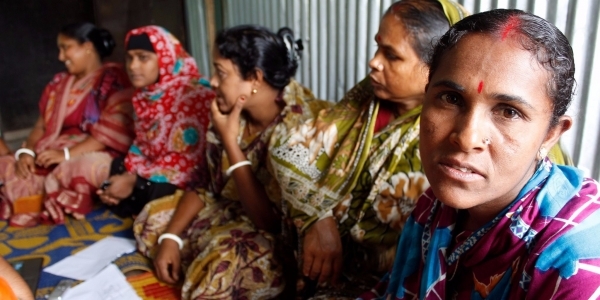 In rural Bangladesh, the patron decides the will of political participation of the client. This makes the vast apolitical at the local level. In the backdrop of such a condition of the UP system to strengthen democracy in Bangladesh, some positive outlooks are observed. What empowers UP are elections on a regular basis, direct representation of women, increasing the rate of people’s participation in local elections, increasing the tendency of the people to participate in different level of development activities of UP, increasing the rate of literacy, expansion of the activities of NGOs and their pivotal role in socio-economic development of women at the local level, expansion of the mass and electronic media, access to information in rural areas, tele-centre for the rural community and introduction of community radio, initiation of UP based budget formulation, and starting village courts as alternative dispute resolution options. The major challenge for the political party will now be to organise themselves with their dedicated supporters who will steer the wheel of the party at the grassroots level. Since almost all parties are centrally governed, there are no existing units and supporters at the grassroots levels. A strong political will is required for the effectiveness of LG as a democratic body in a true sense. To make development really meaningful, empowering and sustainable, the ‘bottom–up’ approach of development that involves people directly in the making and implementation of decisions of UP is the need of the hour. This forces the decentralisation of democracy to the lowest level. While there are problems at the moment, the path to great goals is never smooth. A strong political will is must for the effectiveness of the democratisation within the preview of local government bodies in Bangladesh. Furthermore, to make the development truly meaningful, involving people directly in the formulation and implementation of decisions has been the demand of hour. This necessitates the decentralization of democracy to the lowest level. Let political parties and relevant stakeholders including community people take the lessons from the problems and overcome them for the greater interest of the nation. November 24th, 2017|Development, Featured, Politics, Rural Areas|Comments Off on Are Bangladesh’s local government bodies democratic?